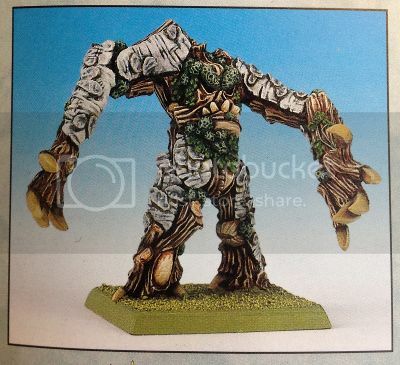 Jon’s Wood Elves Part 2- Treekin! 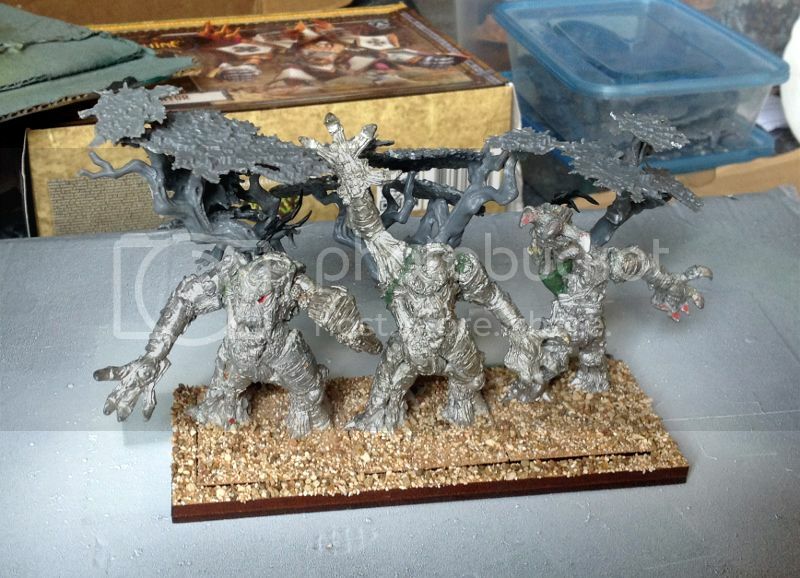 It only took 6 months longer than I expected, but I’ve finally managed to put brush to model with the Wood Elves! I’ll be attending the Blood and Glory event at the end of September which means the full 2400pts of Wood Elves have to be done by then! Should be plenty more blog posts coming up. 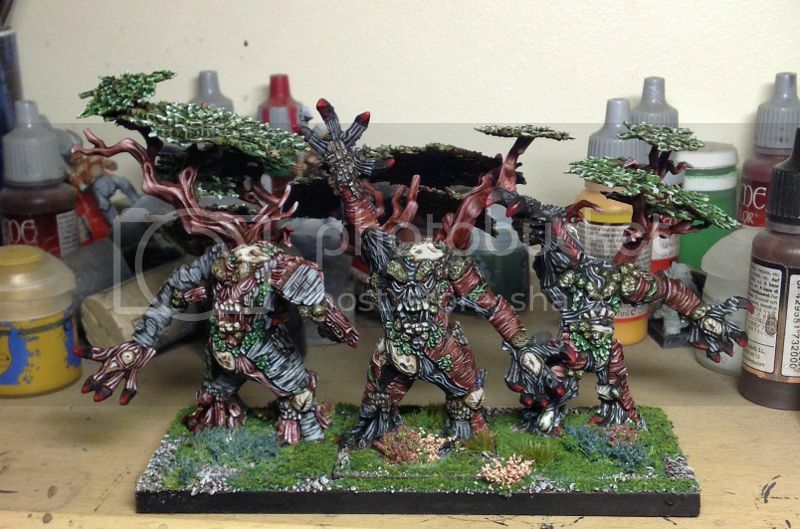 To kick start it off, the first unit completed is the Treekin. 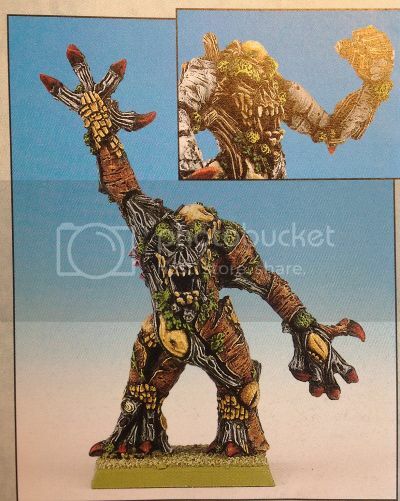 Possibly an odd choice for the first unit but I’ve been pulling my hair out over colour schemes for the bulk of the Elves, yet I already knew exactly what scheme I wanted on the Treekin. I gave up trying to force inspiration with the Elves and jumped in on the forest spirits…. The conversions were simple- old Citadel (or even Marauder!) 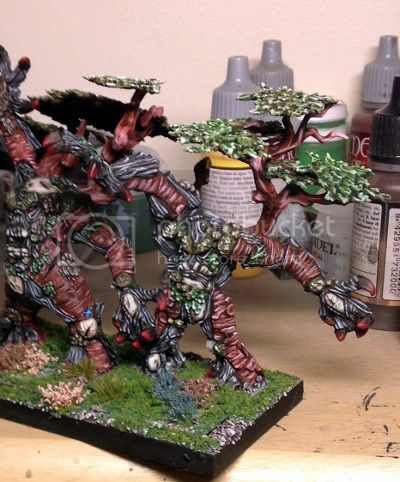 Treemen, with the addition of some foliage from the Citadel Forest kit. 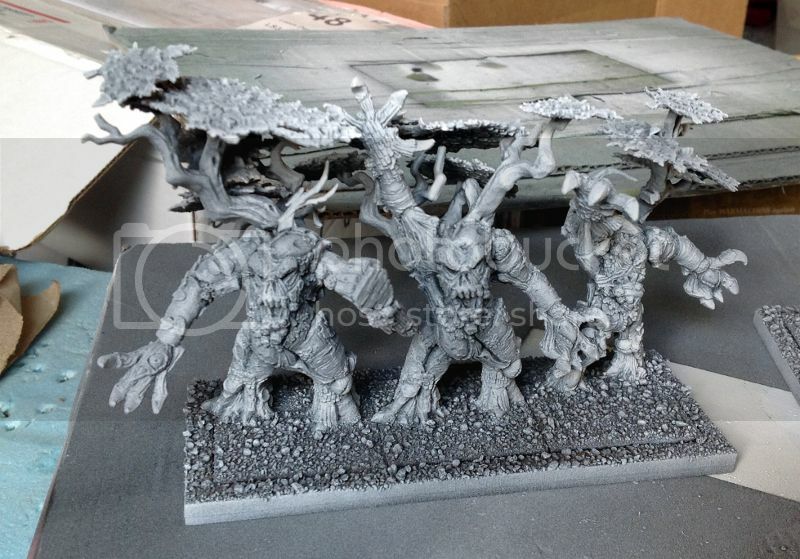 The Treekin on the left is an old conversion which used to be featured in the 5th edition Wood Elf army book- he has Durthu’s left arm to give the impression of punching his own hand in a “come and get it” pose. I loved it since I was a kid and had to recreate it. I knew straight away that I wanted to match the old colour schemes- my original Wood Elf army had a Treeman (in fact, it’s the one in the centre of the unit, although he was so chipped he wasn’t worth keeping, so I stripped him) that my Dad and I painstakingly painted to be as close to the book version as possible, so my paint job attempts to pay homage to that memory! I was really pleased with the result. 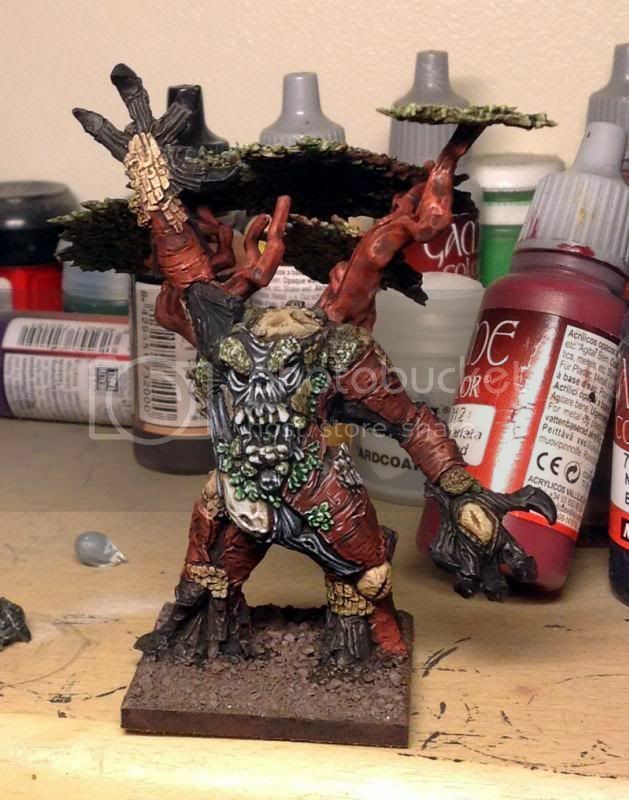 You can see the very WIP shot below- the model was effectively basecoated, washed with Agrax, then highlighted simply by adding bone and white into the base colour. 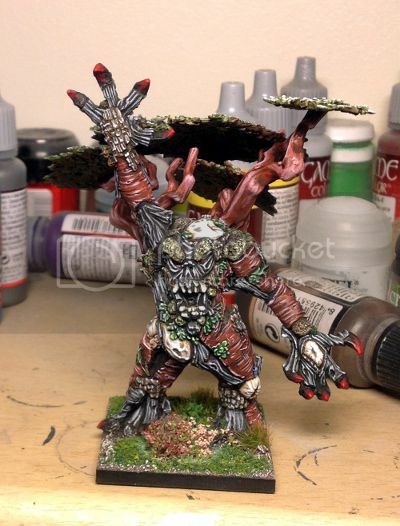 I used a wide range of green and brown washes and glazes, over a range of different brown base colours, to give him a varied and interesting but natural look. In an attempt to make the foliage look as natural as possible, there are two subtly different colours of leaves- one highlighted more with bone and one with white (and a heavier green glaze at the end). The photo below shows them left and right. 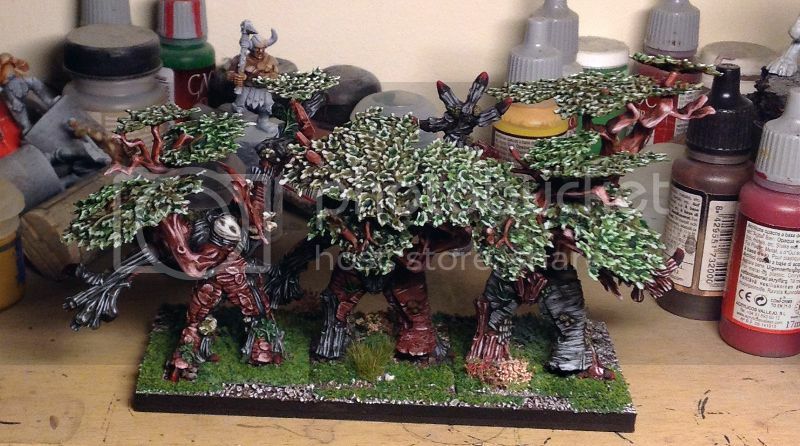 The basing is the same as I came up with for the Woodies a few months back. Essentially, it’s standard grass tufts plus some varied Heather tufts from eBay. After that, two different layers of green flock were added, dark and light, to give the impression of a lush and deep undergrowth. Finally, the finished unit. I’m super happy with them overall and they’ve made a fantastic start to the army to get my enthusiasm pumped! We need YOU! We want to make T4G the best Warhammer hobby blog on the net! Do you have an article, army pictures, or other content that you'd like to share on T4G? Or interested in becoming a regular T4G contributer? Let us know by sending us a message on the Contact T4G! page! 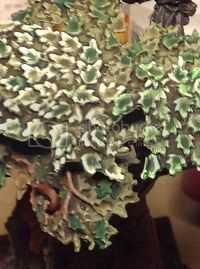 This entry was posted in Army Blogs, The Wild Hunt- Jon's Wood Elves, Warhammer Fantasy, Wood Elves and tagged jon kerr, painted treekin, painted wood elves, treekin, treekin conversion, warhammer fantasy, warhammer treekin, warhammer treeman, warhammer wood elves, wood elf, wood elf treekin, wood elves, wood elves army. Bookmark the permalink.